Resproma, 100% herbal remedy for respiratory allergy. This occurs when airborne allergens are inhaled. These allergens are harmless unless the body's immune system reacts to them by making antibodies. In allergic reactions, these antibodies are in the IgE (immunoglobulin-E) class of antibodies, which stick to the surface of specialized cells called mast cells. Allergens combine with IgE antibodies to release pro-inflammatory substances including histamine, leukotrienes and cytokines from mast cells and other cells in the lining of the nose. Symptoms being frequent sneezing, nasal discharge, irritant cough. This can lead to infections (bronchitis, sinusitis etc,) or bronchospasm (asthma). Symptoms are caused by excessive secretions in the bronchi, spasm of smooth muscle in the bronchial wall, and inflammatory swelling of the bronchial lining (mucosa). These changes cause obstruction to airflow in and out of the lung and the increased obstruction during exhalation leads to wheezing and trapping of air in the chest. The tendency to become allergic is inherited and is controlled by several genes that influence production of IgE antibodies. Allergic disease develops only when a person becomes exposed to those allergens to which he has a genetic predisposition. Perinatal and infantile avoidance of food allergens may postpone development of allergic disease in susceptible children. A fundamental problem in asthma is irritability of bronchi caused by inflammation in the bronchial walls. The inflammation causes loss of protective epithelial cells from the mucosa (lining of bronchial wall), exposing sensitive nerve endings to the irritating effects of chemical air pollutants and dry air. Predisposition to asthma is inherited, probably as the result of genetic factors independent of allergy-determining genes. Recent research suggests that genes that control various inflammatory mechanisms are important in causing allergic inflammation in the lung. Allergic reactions in the lung cause inflammation, during which inflammatory cells called eosinophils and lymphocytes are attracted to the bronchial tissues. Products from these cells cause damage to the bronchial lining, which in turn leads to bronchial irritability that persists for several weeks after withdrawal from allergen exposure. This is most likely to occur when there is a delayed response to allergen known as a late phase reaction. Prolonged allergic inflammation in the bronchial walls may lead to thickening of the supportive membrane under the epithelial lining of the bronchial airways, and to a gradual and progressive loss of the ability of the airways to respond to a bronchodilator drug. RESPROMA food supplementis immunomodulatory to the respiratory tract. It helps desensitizes to the antigens and the mucus plugs are thinned out for better expectoration. As no allergy occurs, no subsequent reactions like bronchospasm, stimulation of mucus glands etc. Moreover the primary antioxidant-glutathione is increased with the food supplement RESPROMA that protects and repairs the damaged respiratory mucus membrane. Bronchial Asthma is an inflammatory allergic reaction of the respiratory tract to specific antigens in the air breathes. 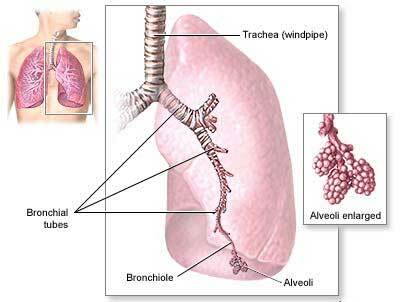 The bronchial tree smooth muscles go into contraction and the tubes reduced in diameter. This causes wheezing (high pitched sound). Allergens can be physical factors, chemical or biological (microbes usually fungi) contents. The antigen antibody reaction releases various byproducts that cause the swelling of bronchial lining inside and spasm of its smooth muscles together reduces very much the diameter. This is asthma. Initially upper respiratory tract shows symptoms like sneezing, watering in eyes, running nose or throat irritation as foreign body sensation. This can be complicated by sinusitis or ear infection. 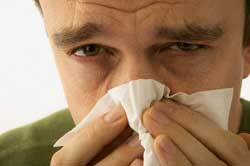 Later recurrent throat infections with sinusitis continue. Then lower respiratory tract shows symptoms of asthma. This can be complicated by bronchitis, pneumonia, emphysema or even heart involvement. Ingredients in RESPROMA helps to improve the antioxidant level on the respiratory epithelium especially the glutathione. Further immunomodulation for the specific antigen results in almost no reaction in the tract. These two can create a state of "no allergy". The mucus secretion of the glands in the epithelium is also brought back to normal as no stimulation for the same. Hence one becomes not asthmatic. What is a respiratory allergy? A respiratory allergy is a specific immunologic response to a normally harmless allergen. These allergies often affect the respiratory system of an individual. What are some airborne allergens? Why do I have allergies while other people don't? 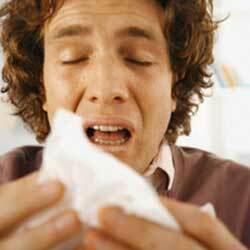 It is believed by researchers that people inherit a tendency to be allergic. However, the tendency itself is inherited, and not linked to any specific substance. For example, your mother may be allergic to pollen, your father allergic to mold spores, while you may be allergic to latex rubber. Although you inherited the tendency to be allergic, you did not inherit the sensitivity to the substances your mother and father were sensitive to. In rare cases, high exposure to allergens at times when the body's defenses are weakened (such as after a viral infection or during pregnancy) can also contribute to the development of allergies. However, this does not mean that every time you get sick you have a high chance of getting allergies. What happens when an allergen enters my body? An allergic reaction occurs when the immune system mistakenly perceives an allergen as an invading agent. When the allergen enters the body of an allergic individual, the immune system reacts to it and attempts to eliminate it. It produces large quantities of immunoglobulin-E (IgE), which is an antibody specific to whatever the allergen happens to be. When the allergen encounters its specific IgE, it binds to it. The cell to which the IgE is attached releases powerful inflammatory chemicals such as histamines, cytokines, and leukotrines. What are some symptoms of respiratory allergies? Pollens are microscopic substances produced by plants for fertilization. Pollens are also the most common allergens. The types of pollen that most commonly cause allergic reactions are produced by common plants such as trees, grasses, and weeds. The pollen granules produced by such plants are specially designed for wind transport. Plants with flowers or other showy features usually do not produce this type of pollen. The pollen grains of these plants (such as roses) are carried by insects, and do not rely on the wind to transport them. Therefore, they rarely reach human noses. It is common for people to believe that they are allergic to scented flowers, such as roses. In fact, only those who have prolonged exposure to such flowers (such as florists and gardeners) are likely to become sensitive to the pollen of these flowers. This is because the pollen produced by roses is not only heavy and waxy, but also is carried by insects rather than the wind. Therefore, it hardly ever makes contact with a human nose. How can I avoid pollen allergies? Respiratory allergies are not the same as food allergies, in that they are harder to avoid. Pollen is a substance that is harder to avoid than the average respiratory allergen. The only way to avoid pollen is to not venture outside. A pollen count can help allergic individuals decide whether or not they wish to go outside during certain times of the day, or on certain days. This figure represents the concentration of the pollen in a certain area and a specific time. It is expressed in grains of pollen per square meter of air collected over twenty-four hours. Pollen counts tend to be highest on warm, dry, breezy mornings and lowest during chilly, wet periods. Although a pollen count is a useful guide for allergic individuals, it is important to remember that it is an approximate and fluctuating measure, and does not necessarily restrict you to staying indoors. It is simply a guide for individuals wanting to minimize their contact with pollen. Molds can generally be found in any moist area that has oxygen and several other minerals. 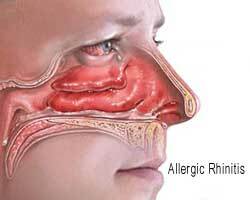 When inhaled, microscopic fungal spores may cause allergic rhinitis. Due to their small size, they often evade the protective structures located in the nose and the upper respiratory tract. In some people, symptoms of mold allergy can be worsened by eating certain foods that are processed with fungi (such as cheese). The mold season peaks from July to late summer. Although most of them become dormant during the winter, some continue to be active. In the warmer areas of the United States, however, molds thrive all year round, and can cause problems for allergic individuals. Similar to pollen counts, mold counts are also given on weather reports. However, since the presence of spores in the air can change considerably within a period of 24 hours, they are not as useful as pollen counts. Dust Mite Allergies are due to a microscopic organism that lives in household dust. These allergies produce symptoms similar to those of pollen allergy and asthma. Dust Mites are probably the most common cause of perennial allergic rhinitis. Microscopic mites often reside in bedding, upholstered furniture, and carpets. They thrive in the summer, but most of them die during the winter. However, there are still many that thrive in humid homes during the winter. Often, an allergic reaction is caused by dead dust mites and their wastes, or wastes of cockroaches. Animal allergies mostly occur from household pets, such as cats, dogs, and rodents (guinea pigs, gerbils, mice, and rats). The cause of the allergic reaction is from animal dander and protein from their saliva. Cats lick themselves often, depositing the protein on their fur and increasing the chance for an allergic individual of experiencing a reaction. The major source of allergens from rodents is in their urine. Animal allergies are not immediate, and take up to two or more years to develop. Similarly, symptoms may take six months or more after ending contact with the animal to disappear. RESPROMA is an Ayurvedic preparation that has been used for more than 200 years. RESPROMA has been used for generations and by thousands of people. This is a formula derived and time tested by the Chavarcode Ayurvedic physicians. For best results, no food should be taken 60 minutes before or after taking RESPROMA. 1. Piper Longum: This is a dried fruit that is tiny. This has pungent smell and spicy flavor. This is a well known immunomodulator, especially of the respiratory tract. It has mild bronchodilator effect also. Increased ciliary movement (expectoration) of the tract is ensured that clears off mucus. 2. Zingiber Officinale: Dried rhizome that has cough suppression and smoothening of respiratory tract. It is mucous depressant. 3. Glycyrrhiza Glabra: Another dried bark that has powerful anti-inflammatory, immunomodulatory effect in respiratory tract. This has systemic immune stimulation. It has ability for Cellular stabilization and repair. 4. Solanum Xanthocarpum: It is a powerful bronchodilator with mucus suppressant. It controls cough reflux centrally. It is a mucolytic agent too. 5. Holostemma Ada-Kodien It is a tuber that has principles to boost general body resistance as white blood cells increase in count. It takes care of the total body tuning. 6. Smilax China: This is a dried tuber that has tremendous anabolic precursors that body takes to form natural protective and wound healing properties. It has plenty of anti-oxidants too. I am a 27 yr old female who has suffered from asthma for the last 10 yrs. I was using a steroid inhaler prescribed by my Doctor, for several years. I also have a strong family history of allergic respiratory disease. Things like House dust, smoke (hydrocarbon), paper dust seem to trigger my asthma attacks. I was using the inhaler three times a day containing Beclomethasone and Bronchodilators. Even then I was still having difficulty breathing. I was in search of an alternate remedy and found RESPROMA in a Yahoo search and ordered a one month supply online. After 3 weeks of taking RESPROMA I have noticed major changes in my breathing capacity. After realizing how well it was working, I ordered an additional 3 month supply. After two months of being on it, I've had no cough, no sneezing and no runny noses. Most importantly, my asthma has gotten significantly better. I have reduced my use of the steroid inhaler because I haven't needed it as much. Approximately three months later I stopped all steroids because I no longer needed them at all thanks to your product. Now after 6 months I am completely asthma free with no cough and no sneezing. This is a great product. I wholeheartedly recommend it to anyone who was suffering with Asthma and allergies. Thanks to GurusGarden. I am parent of 13 yr old girl. My daughter has had many absents from her school due to frequent illness. It usually begins with frequent sneezing and a dry cough and ends in secondary infections that lead to asthmatic bronchitis. I also had similar problems in my own childhood. Through one of family friend, we came to know about RESPROMA and visited the website. We ordered a 1 month supply online. Believe it or not, after the first 2 weeks my daughter has never again been absent at her school up until today. After 1 month only, not even a sneeze or a cough. The herbalist online advised us to continue RESPROMA for a period of one year. I would like to say that we have brought many alternative products from the internet but none worked like RESPROMA. This is the best formula for respiratory allergies that we have found to date. Thank you for helping my daughter.